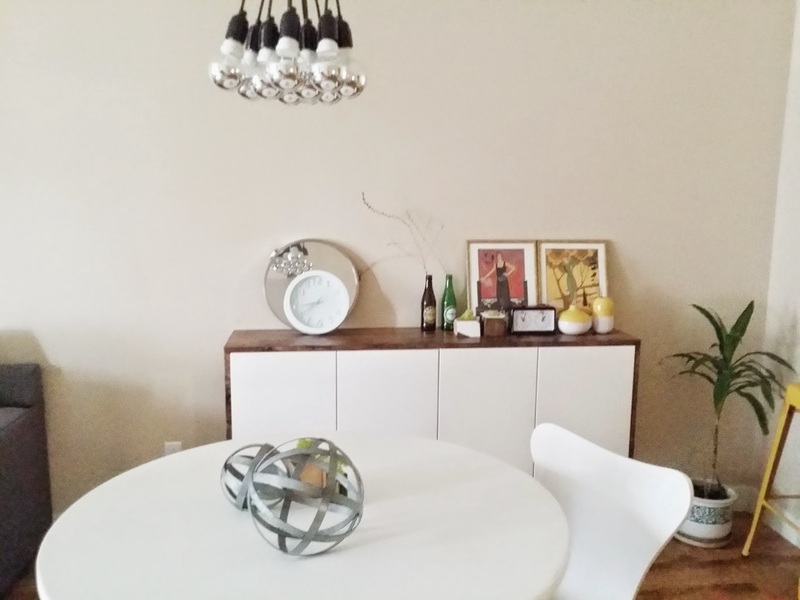 I wanted a modern, space saving, unique, credenza. 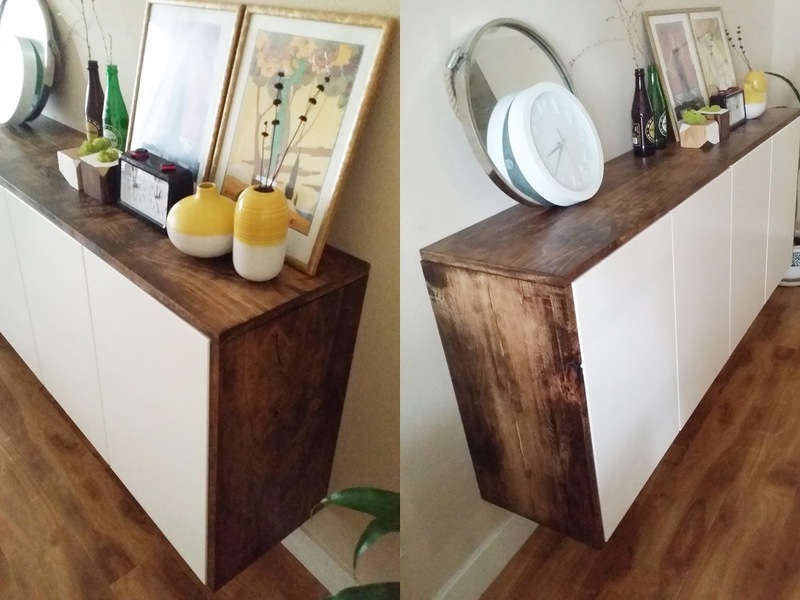 Scoured the internet for some cool ideas and decided on the floating Akurum Ikea fauxdenza hack, aka Akurum kitchen cabinets. 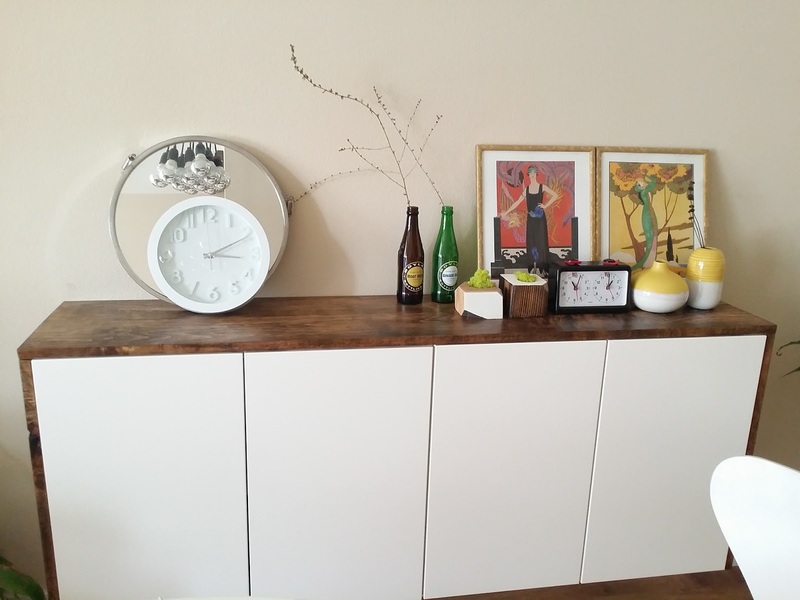 This ikea hack is an easy weekend project for home improvement enthusiasts. 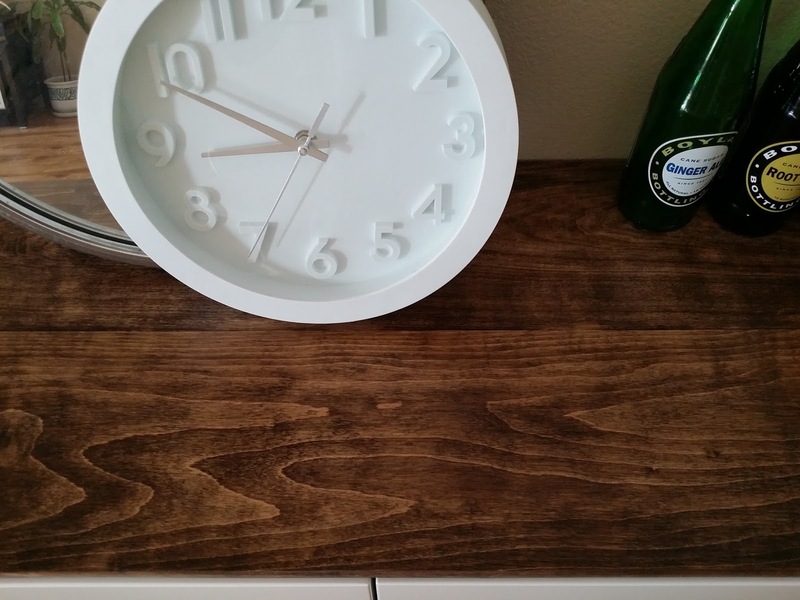 I am very happy about the way it turned out and love the richness of the stain on this beautiful Birch wood grain. 2 Ikea akurum cabinets (doors, shelves, door hinges (availible here) - I went with the 30" wide x 24" tall x 12 7/8" depth. Wood 1"x7" of your choice - I went with Birch for my wood wrapped topper. 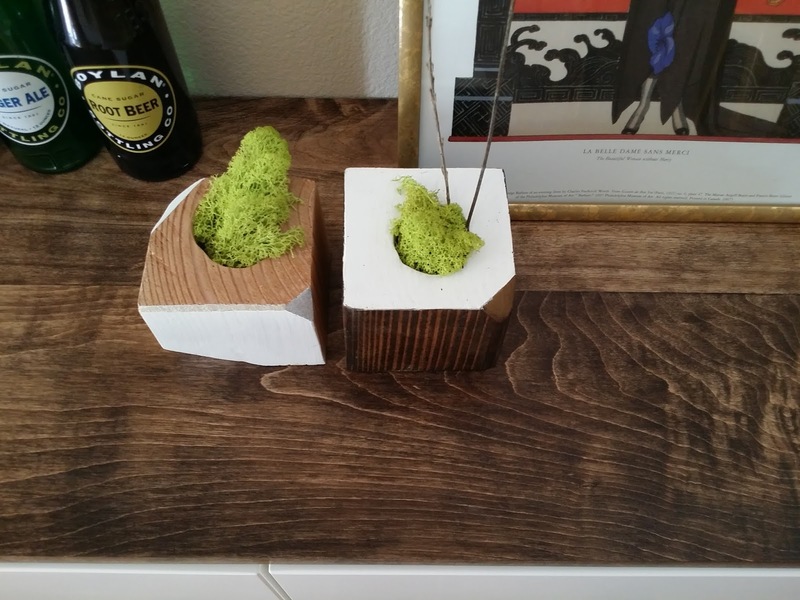 Poplar is a softer wood with more of a green tone. Birch is similar to Maple but cost a bit less. Birch may run you about $5 to $8 a sq foot. It will be tough to find a plank over 13" in width, therefore buy 2 - 7" wide boards and cut to 6.5" each. Clamp and glue both together to get 13" wide boards to fit over the ikea Akurum (depth of your boards may vary depending on which Akurum depth you chose). Orbit sander and 80 to 240 grit sandpaper to smooth out your wood planks. Tite bond 2 or 3 (availible here) - this glue is supposed to be strong enough to hold 100 + lbs. Glue your precut boards together and clamp overnight (suggest 24 hours to cure). 3 - 4 clamps (available here or here) - to keep your boards together after gluing. These clamps are also very useful for other wood projects. 1 Ikea akurum suspension rod - This 6 ft long wall mounted rod should be cut to your desired width. I cut mine to 58" since my credenza was 60" wide. Stain of your choice - Minwax provincial shown above. I tested out 3 stains. 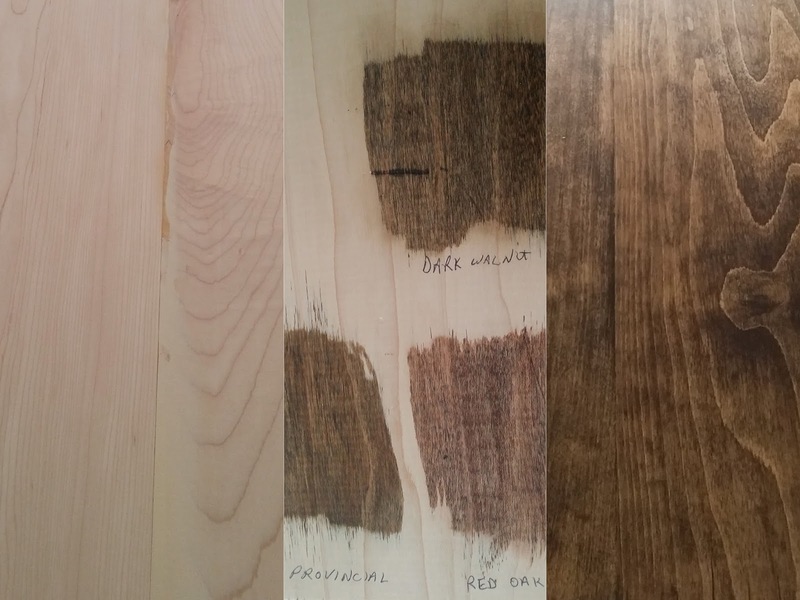 Usually Ganahl Lumber allows you to test out stain colors on the wood of your choice. Sealer of your choice - Minwax matte finish shown below. 1.5" wood screws to secure your boards into the credenza. Roughly 3 afternoons due to staining boards, waiting for the glue to dry etc. Hey, thanks for giving me an idea. This is very helpful for me. I'll try this on my home in House and Lot Cagayan de Oro. Thank you very much for sharing!